Publishing a book is an immensely satisfying and rewarding experience. Creating your own book is something I would thoroughly recommend, be it a work of fiction, your memories, family history or a passionate interest. You are creating something that your children and family will treasure long after you are gone (even if they never actually read it). If you are thinking of publishing a book, I would be happy to chat with you. I can also design and set your book up electronically so it is ready for the printers. Superhero Foods is an initiative developed by Foodbank WA and myself as a nutrition education resource for primary school aged children. This project has been a pure delight; made enjoyable from start to finish by the lovely author, Angela Moyle. Australian Capital Adventures feature charming Aussie animals visiting ACT hot spots like Parliament House, Floriade and Canberra War Memorial. 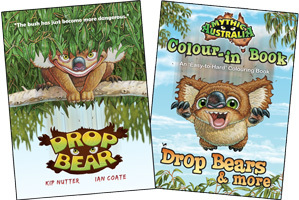 ‘Mythic Australia’ is a comprehensive bush guide to Australia’s magical creatures, illustrated with full colour portraits set to thrill even the most unimaginative youngster. Included in this collection is a series of Aussie fairytales staring home-grown heroes suddenly thrust against fantastical creatures lurking unseen in the enchanted Land Down Under. Another eminently worthwhile project to work on. The HELP series endeavours to visually teach the basics of first aid, like: hygiene, burns, bites and brakes, to age groups and cultures that have low literacy. A range of Missionary Children’s Books for Basic Training Bible Ministries. Published in four languages and distributed throughout America, South America, Africa, India and Australia. These series of books were a pleasure to do; not only are they fascinating books regarding Western Australian history, but I spent many a fun day working with my mum designing and laying them out. Joe is a true story about a cheeky Blue-eyed Cockatoo who lived a carefree life as a young girl’s pet on a remote Pacific island plantation. The accidental meeting of an aborigine and a mermaid will change forever the way you view traditional stories and folklore. One of my earliest publishing projects was Billabong Valley working with the talented author, Don Cronk. For a self-published book, Billabong Valley has done extremely well. To the present day, it is sold in all states of Australia and has even had success overseas. I was seventeen when first asked to illustrate covers and contribute internal artworks for Australian Realms, a magazine for role-players of games like Dungeon & Dragons.